Chan 13 came out and interviewed us. would be no such ICU Ministry. Been a long weekend. On Tuesday I am speaking to a group of lady's from Hardison Baptist Church about my ministry. I enjoy getting out and meeting folks and telling them how ICU ministry got started. God give me the words to continue this path you have me on. Hopefully give some motivation and fellowship to some special ladies. Thank you Ms Maryann Barbour for this opportunity. Today was a great day. Small crowd me , glenda,and BarbaraY. family during this time of losing a love one. I took bags to Houston County Hospital they have 45 ready for needy family's. Watch WMGT 41 this week they are showcasing Byron Georgia. I received a envelope in the mail on Monday from a lady in Milledgeville enclosed was a donation no note just a check that noted Thanks. I am a DAUGHTER to a patient who was in ICU at the medical Center(April 26-30th) I too was there 3 weeks & 3 more in Hospice in Perry. My mother died June 5th in hospice "MATTIE NASH"
I was very tired & bewildered when we had to move mom 4 times God knew what had to be, but not me. Our last move god arranged for me to meet up with a very close friend and co-worker. Before I signed the papers. She was working at hospice. We cling ed and cried she was my "SPECIAL ANGEL" there she prayed with me held me when I needed it and let me know what was next. God please be with these special ladies as they go down the path from their ICU experience and thank you lord for my path of this ICU ministry. I am blessed just to be a part of these special families and I pray that you allow me to continue to touch lives till the day I come home to you. We had a great time at last weeks workshop. helpers Ms Fran Sanders and Ms Barbara Yeates. We made about 110.00 for the ICU account. Thanks ladies for all the hard work!! special ladies pulled my weight. I delivered 50 bags to the Medical Center of Central Georgia. They were about 5 family's in the heart ICU, and about 12 to 15 families in the other ICU waiting room. Please pray for the ones that are there with their family's. And lets all be careful during this holiday weekend. Everyone is excited about Summer and they get in a hurry and accidents happened. So enjoy yourself but be SAFE!! Please pray for the family of little Olivia. She is a little 6 year old who went to be with the lord yesterday afternoon. Loss is always hard no matter what age but its more difficult when they are are babies such as Olivia. Please Lord lift her family into your arms today and comfort them through your strength and wisdom. A special prayer goes out to Julie Love a friend who made little Olivia a quilt over the weekend and delivered it to her just hours before she passed. Julie you will be blessed for such acts of kindness that you shared. It was the very first quilt completed and delivered from our Comforting Quilters group what a special gift to have our first quilt going to a remarkable family I just hope it will comfort that family during this time in their life. What a great day yesterday. The day started with a phone call from a guy who lives in Miami, he wanted to thank us for his bag, what a blessing to get a call when that happens I realize we are touching lives. I hope he keeps in touch. We had another successful day of sewing we completed 22 more bags. And Ms Kathy learned to use her new sewing machine praise the lord we have another sewer. what a great day we had. Rachel from 41 came out and did the interview she was their about an hour what a sweet girl. I thought it went well we made lots of bags. Went went out in the rain and delivered to the Medical Center and the Coliseum around 60 bags were delivered. And the waiting rooms were full. The story was suppose to air at 6 but they had weather problems so it aired at 11 and then is on line so I hope you enjoy the interview she did a great job I cry every time I see it. Hope to see you all Monday May 3rd at 930 am chan 41 news is coming to do a story on us. Lets spread the word to always pay it forward. We had a great day at the Battle. Sold a few pnuts. WeT made around 300.00 for our ICU fund. Thanks for all the help Ms Jessie, Carolynn, Julie, Barbara,Karla, Diane, Kathy. Judy, Ms Annie. I love you all!!!!!!!!!!!!! Enjoy the Beautiful quilts old and new on display from some local family's collection. ALL PROCEEDS GO TO COMFORTING QUILTERS AND ICU MINISTRY!!! On Thursday's workshop we had a wonderful day. Lots of visitors. Ms Kathy Garrison stopped by and helped for a few hours. That sweet Ms Oneal stopped by and brought in some bags, blankets, wash cloths, and magazines she is so sweet she sews at home a drops off. Ms Marie Peterman brought in some magazines and pillows. Linda Peacock left a box of toiletry items for us. Completed 29 bags ready to be delivered to local hospitals. Don't for get the May 1st The Battle of Byron 9-4pm we will be there selling Boiled and roasted p-nuts all proceeds go the our ministry. A little note: Saturday a local lady Ms Marcie Hinson called and said her heart was leading her to call and donate to this ministry I went over and had a had a wonderful visit. What a sweet lady she lost her husband to cancer in Feb. and is on a fixed income and still made a generous donation. God will surely bless all these new friends. So much going on since the article came out. Several several call donating fabric. I am so blessed that people are interested in the ministry. Channel 41 news is going to do a story on us on May 3rd. at 10 am at the depot let me know if you can attend. Also they are wanting to know folks that received a bag so if you know anyone that we have touch in any way please call me with their info so I can pass along to the reporter. Remember Thursday is our next workshop hope to see ya there!!!! What a blessed day. More call came in today from folks wanting to donate and wanting to come help sew. But around 11 or so I got a call from a nice lady that told me she had some material that she would like to donate. We set up a time and about 430 she arrived with her car loaded and I mean loaded. The picture speaks for it self. She even included the plastic containers. Her name is Ms Nancy Hill what a sweet lady she expressed she doesn't normally read the paper that close and some reason she did on the 14th. God is good. We had a nice visit she sits with patients and is down to one day a week. So if anyone knows someone that may be in the market for a sitter or maybe a light house keeper no heavy lifting let me know see if we can pass along the favor... She lives in WR so would like to work between Byron to Perry. She was a blessing to us lets pay her back with some jobs. What great day. Lots of phone call about donating and volunteering. Even got a call from Channel 41 news about some info on the ministry. One nice lady Ms Woods donated a big bag of fabric. God is good we are so blessed to have folks that care. Thanks to Ms ANgela for caring enough to write the article. 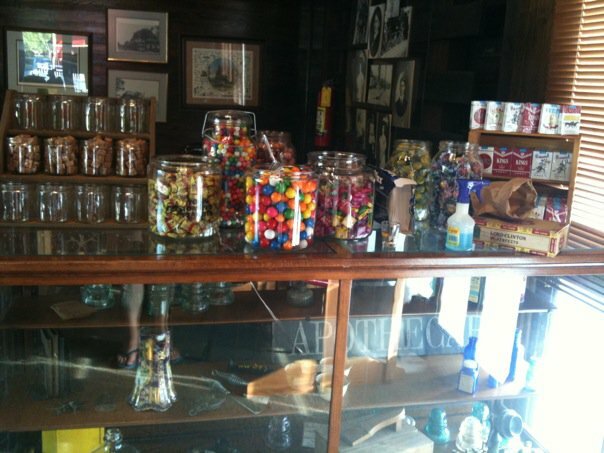 Take a tour through our historical depot museum for our 1st Quilt show. Learn the history of our town as you view the beautiful quilts on display. A great event there's something for all ages!!!!!!!!! At last weeks workshop we completed 62 bags/ It was a great day me- Karla-Kenneth Micheal-and Glenda all helped. The Macon Telegraph stopped by to do a story on our group. It will come out in today's paper. 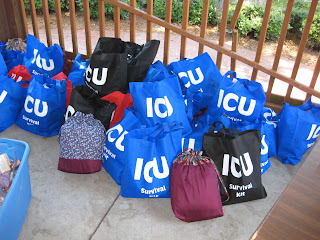 On Tuesday the 13th I delivered the bags to the hospitals in Macon. Its amazing my car was loaded and after I went around to the folks in the waiting room it only left about a dozen extra for days to come so we need to sew sew sew. I spoke to the Coliseum hospital about maybe doing a workshop at the hospital and getting the employees involved. I can feel we are doing a great service for our community. spend your days passing it on!!!!! Hey guys don't forget we will be at the Depot from 1-6pm today. Macon Telegraph will be there to do a story on our ministry. I'm sadden to write this blog. A friend Tim Dupree was killed in a car accident on Easter Sunday afternoon. Tim was a kind and gracious man. He did so much for our community, he will be truly missed. Some of you may not know this but he worked for the company that we get bags from as backup to our homemade ones. The first order that we got Mr Dupree would not let us pay for he stated that he believed in this ministry and wanted to purchase them for us. I was so touched by this. I love you Mr Tim and you are truly missed!! What a beautiful day we had today at the Saddlebag Express Festival. Me and Ms Jessie ran the p-nut booth. We had boiled and roaster p-nuts. We sold over 100 bags. We added 208.00 to our account we will use it to buy some material for making blankets as well as we need to purchase some bibles. Thank you lord for a wonderful day as we continue to serve you. What a fabulous day the weather was perfect We were at the Depot and had all the doors open sewing and enjoying the breeze. We were making baby blankets for the Baskets of Joy ministry. We completed 43. We also completed and packed 27 ICU bags that I will deliver tomorrow to the Houston Heath Care Hospital. Thanks goes out to Glenda Myers, Karla and Kenneth Micheal Chidester for all their hard work. What a blessed day that will continue to bless the ones that receive one of these bags, and the baby's that get the blankets. Our baskets of joy project began fourteen years ago when we learned many of the children who were living in local children Home did not receive Easter baskets. Over the years our project has grown to include Georgia Industrial Children Home, Hephzibah Children Home, Masonic Children Home, The Elizabeth House, The Dove Center and some local foster homes. With the help of family, friends, and churches, organizations and businesses along with lots of prayer, we have provided over 1,725 children with Easter baskets. Having grown up in a children home and knowing the feeling of not being able to experience some of the joys other people experience has made this project very closes to our hearts. Each basket will contain a small bible, a stuffed animal, a chocolate bunny, small gifts, candy and treats. Most of all, each basket will show a child someone cares about them. We are requesting your help in making our project a success by donating baby blankets. Baskets of Joy is affiliated with Kids Yule Love and can provide a tax ID number upon request. Your kindness and generosity in making the difference in the life of a child will be greatly appreciated. Thank you for considering our request. We look forward to hearing from you before March 8th. You may contact Katie at 578-836-5413.
also Katie Jones from Baskets of Joy wants us to sew her some Baby blankets for her up coming Easter baskets. I will post the contents of the letter she sent us. Look forward to seeing you all!! We will be concentrating on sewing come on out and fellowship while we sew. We received a letter from a lady who received a ICU survival kit. She stated that her mom was in ICU for 5 weeks her and her family lived out of town and someone stayed there at the hospital 24/7. The kits were much appreciated she wrote. But the most important thing were that the bags were filled with prayers meant the most to this family. Our work is so important and will continue as long as I'm breathing. God is good.